Antiques challenge. 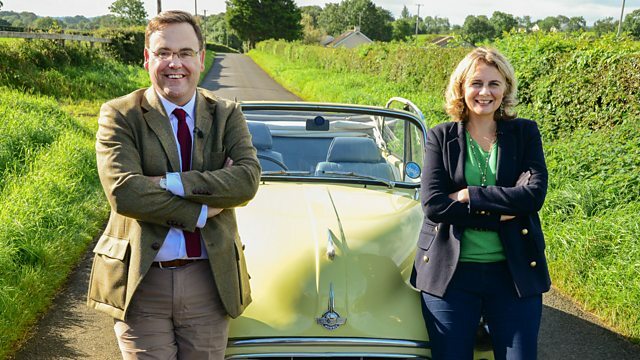 Auctioneers Catherine Southon and Paul Laidlaw embark on the last leg of their road trip, shopping in Perthshire and Angus. That's the way to do this! -..with £200 each, a classic car and a goal - to scour for antiques. Somewhere in this Scottish mist are Catherine Southon and Paul Laidlaw. -This is a bit Macbethian. Can I say that? -It is dramatic. A dramatic final. a thrilling showdown in Aberdeen. -return for victory at the auction? Who knows what can jump out from behind this hedgerow? even though it does date from an era before seatbelts were mandatory. They've certainly come a long way together. -Well, we're touching on the north of Scotland. -Profitable too. Especially for Paul. ..leaving Catherine feeling rather joyful. Well, we're not equal on money, but we're equal on the auctions. -You've won two and I've won two. -You're getting a bit hot under the collar already, aren't you? Catherine started out with £200, which has been nudged up to £257.92. While Paul's identical stake has thus far more than doubled to £402.46. several hundred miles later, in Aberdeen. direction towards that deciding auction in Aberdeen. They used to make pistols here long ago. fired the first shot in the American War of Independence. It's a very large establishment you have all to yourself. Yes, all this stuff belongs to a whole heap of dealers. It's just a question of tracking one down. There's a chap there who has got his hands in the cabinet. I'm guessing he's got to be a dealer. I'll go and have a word with him. It could save me hours. -Sir, I presume this is your stand? David. Hi, David. Good to see you. -Oh, Louis Wain. What's that Louis Wain book? -Have we got to wait for it to revolve? -Oh, in the meantime... Hold on. -Oh, that's quite cute, isn't it? -Little Deco compact. I like that. -It's quite a nice design, isn't it? -What are you asking for that? What's your best on that, then? What would you do on that? Getting close. Quick! The book is back. -See, what drew me to this was the whole Louis Wain thing. who was just mesmerised by cats, did lots of cat illustrations. But what is this? Can you tell me a bit about this? Obviously this is an early book. It's very rare. who once owned it. I mean, we used to do that. In pencil - it can be rubbed out. I like that. What have you got on that, David? But what would you offer me on it? Ideally, I would love to pick up something like that for about 35. -Make it 40 and you can have it. -What do we say on this? -Can I just have a little think? -What about if I did the two for 65? I will definitely shake your hand and run away with both of them. Right, what about if we say 60, then? 58 and you've got a deal. So, while David gets back to his cabinet, Catherine's work is done. the clouds have parted for Paul in the Highlands. of the place where they locked up the most dangerous Nazi prisoners. It looks incredibly intact and well preserved. -It is like driving back into time. over 100 different buildings that are historically important. They were only designed to last for 15 years but they have survived. as the Black Camp of the North. and also we had a lot of SS officers that were sent here. and then they had gone into the SS. They were the hardest, the most fervent Nazis. -and black if they were fully committed to it. and it had a reputation for violence. margarine, marmalade. Bean soup for dinner. the experience of British soldiers who were being kept in Germany. because we wanted our soldiers to be able to wear their uniform. when a white Nazi was murdered here by his fellow prisoners. in a British Army uniform. Herbert Sulzbach was just an extraordinary individual. He won an Iron Cross at the Somme and won another Iron Cross in 1918. But in 1937 he had to flee Germany because he was a Jew. that we sent him to was Cultybraggan. His job was to re-educate the Nazis. It was the de-Nazification of the Germans. was like knocking dust from a roof - it was easy for him. to re-educate Germans about Allied Western ideals. Despite working for the enemy, Sulzbach was listened to and trusted. that the Fatherland had committed these crimes. whether they were enemy or whether they were comrade. John McCrae's poem In Flanders Fields. -and that's what they do. -What a good, good man. Yeah, a really, truly good person. by the local community in 2007.
in Perth and Kinross, in Rait. Does that make it "bonny Rait"? Ha! This looks beautiful in here. Yeah, shame you have less than £200 left to splash. What's that little bell? That's nice. It has been a hotel bell, I think. But it is actually gilded, so it has got a fair bit of age to it. Yeah, I would have said it is about 1870, 1880. -Yeah, can you do a good deal on that? -I'm sure I probably could. I love a bell. It is slightly wonky, or is that me just being fussy? You have got to be fussy at this stage in the game. Come on, then, what's your best on that? in a big job lot of stuff at an auction. I don't buy job lots. Oops! The ticket price is £50. -You couldn't do 20 on it? -30, then it would show me a £5 profit. I'm going to put that there. that gilded one at the front, which is quite nice. -I would think it is a champagne flute, yeah. And it's gilded as well with the most beautiful decoration. -Would you think a bit earlier? you can see there's imperfections in it. they were really going to go for it and you can see that here. There is a bit of wear. -Well, you might be a bit worn if you were as old as that! -What have you got on that? -Can that be, like, 20, then? But 30, I will do it for. -OK. Can I put this in with my little bell? We are having a bit of a Victorian selection here. They're made of turned lignum vitae. and they are pretty smart. I have sold these before and I have done quite well with these. I wonder if he can do a good deal on those. -I do play green bowls, yes. That's the small talk over with, then. Can something be done on that, something substantial? 75 would be the absolute best on those. The carpet bowls are on the list and I think she has designs on the lot. Can a deal be done if I took all these beautiful items from you? -Initially we said about 30 for that, right? And then you said 30 for that. I was thinking of a bit less and I was thinking maybe 50 for the two. Right? Stay with me, hear me out. and maybe say 50, so £100 for the lot. -because they cost more than that, unfortunately. What about £110 for the lot? That's fair, isn't it? I'm really struggling at 110. Make it 115. 115 and that would make you...? I might be able to have a fish supper tonight, if I'm lucky. -Aww, I don't want that! Go on, then. -I can't do that to you! -You have got to have a decent supper. plus haddock and chips for Andrew later. Yum, yum. at the delightful village of Comrie. than anywhere else in Britain, hence its nickname of Shaky Toon. -Yeah, pleased to meet you. Off you go, then, Paul. -But it's not for me. Oh, my word, that's delicious. to work up the budget to buy it! -What about the stick stand? Is that dear? -Price on it is 78. That's elegant, narrow, but it's way too much for me. What are you like on flexibility? Well, offer me a price. I think it's worth £40-£60. I like that, but that's a £35 purchase to me, that. Of course, Paul has already bought a stick stand this week. Oh, it's deja vu all over again. -The bolts that secure the dividers on that are loose. And you can't get at the heads of them because they are concealed. So the darned things twist and turn. See, that is how it should be - nice and rigid, fantastic. goes skewwhiff and if you're like me, you then can't sleep at night. Thankfully, the rest of us aren't so afflicted. So I'm offering 35 quid. I'll give you some money and I'll be gone. Now the hard work is done. Time to get ready for tomorrow, so nighty-night. Next day, it's not so much Scottish play, more Saint-Tropez. Paul, we've taken a wrong turn. -We are in the South of France. meaning he still has over £350 left. -Shall we spend all our money? Shall we? -Let's go for it. Let's be united. It's not stupid! Why are you laughing? Oh, you never play the game, do you? Oh, yes, he does, Catherine. but our next port of call is Arbroath. a side from Aberdeen by the record score of 36 goals to nil. Ha! Hello, how are you doing? I'm Paul. Hiya, Paul, nice to meet you, I'm Colette. -Good to see you, Colette. There's a lot of choice. Look at that! I've got a few really nice things in the back. Oh, you tantalise me, Colette. Oh, yes. Mention the back and our lot are all of aquiver. -The nerve centre, is it? -This is the nerve centre. This is all stuff that's not been priced up yet. You trust me just to have a wee rummage, then? but I think it's delicious. Take a look at that. In black enamel, in silhouette, this dancer. And whose music is she dancing to? That of a fawn, half chap, half goat. That works, that's charming. It dates to the 1920s, 1930s. Here is the problem - ta-da. The pin is a paperclip. you buy a cheap throwaway brooch and you swap the pin. -That's a start, is it not? with a few of his purchases this week. Add to that these assorted silver thimbles. The piece for me is the royal commemorative. Now, which royal commemorative is that? The coronation in 1910 of George V.
-and you have half and I have half? -What's the price on those? -Throw something else into the melting pot. What's the price on a wrecked brooch and thimbles? How about we do 65 for the lot? I am not going to give in that easily. How about I come down a tenner? So basically you're getting that for free. Basically, Colette, you've got a deal. he's got a much more Paul object in mind. This tool is a clinometer. of the barrel of a three-inch mortar. A mortar is a type of artillery for infantry use. That's neither use nor ornament. it is utterly authentic Second World War ordnance equipment. And because of that, Laidlaw is a little drawn to it. -You've heard all of that, haven't you? -in so far as they are brass and military. -Put them on the table and see what we can do? This is turning into Supermarket Sweep. which is Latin for "everywhere". which can be made into a little petrol lighter. that is an auctionable lot. and I'm just going to hit you with a little offer. Oh, hit me, hit me. I am going to pitch 15 quid. How about 18? And then we're both happy. So, that was 55 and 18. And I've got no money, so I was just wasting your time. -Colette, you've been an absolute diamond. greatest feats of engineering, the Bell Rock Lighthouse. and if we go indoors, I can show you a little bit more. the beacon and Arbroath Signal Tower were the solution to a pressing need. -I'm guessing this is Bell Rock. -This is the Bell Rock. that there was a dangerous rock there. That bell was allegedly stolen by a Dutch pirate. increased, a manned lighthouse was required to keep mariners safe. permission for a lighthouse to be constructed. and it was he who supervised the hazardous building work. the rain and everything, the conditions were harsh. I can see there's the model there. that's like the foundation, that's the beginning of it? But what's that at the back of it there? but then it was converted into what they called the barracks. they could go into the barracks, maybe have something to eat. But they also slept in it during storms as well. and began operating in early 1811.
there have been only two recorded shipwrecks. and trial and error that they went on to use in later projects. since 1988, the link between them was once vital. So, how would communication actually work? that would have reflected the sun. the lighthouse, that was the signal that all was well in the lighthouse. had to dispatch someone out to investigate. -Turning this handle just raises the ball. And good exercise as well. as the Montrose Basin, Paul's off to his very last shop of the week. I love the feel of this place, I don't mind telling you. This is my kind of shop. Yes, I think the expression "old school"
might be appropriate in this instance. What's the story of the mirror in the doorway? -Is it anything or nothing? That could be yours for 40.
Who knows what he'll emerge with? This is a big lump of pot. which is a French word that translates to "hide the pot". You might call it a jardiniere. Basically, you stick your plant pot in there. How do we tell a cachepot? A cachepot won't, and this doesn't, have a hole in the bottom. There is no ticket price, either. loads of Bretby stuff is pig ugly. Which is why I have never bought a piece of Bretby in my life. This, however, I am going to concede to you. It's about 100 years old. It was pre-First World War, so let's call it belle epoque. almost aesthetic depiction of birds and blossom works. It's a standout thing. Let's have a wee look. Well, it sounds fair enough. Dusty, honest, nobody has tried to improve it and no restoration. the Aberdeenshire village formerly known as Summerhill. -Hi, Brian, good to see you. What else can Catherine squeeze into her trolley? You could do some serious damage with these. These callipers, where have they come from? They came along with a load of cooper's tools that I bought. or barrels for holding herring. -They are meaty, aren't they? You have got 32 on those. I mean, is there a lot of movement in them? There's a bit of movement in the price, yeah. I wouldn't offer any more than £10. Are you familiar with the term "on your bike"? I thought we were getting on so well! It's a nice little telescope. The big, big downfall is the fact that you haven't got your lens cap. Yeah, I was wondering that. I mean, it's pretty good. It's got the name on it, the maker. Nice that you have got a nice Scottish name on it. Would these have been used just for pleasure purposes? Yeah, absolutely. I mean, this is just a gentleman's pocket telescope. -I hadn't seen them with as many sections before. cos that's what people look for. -Mmm, that is a shame. -What can you say, eh, Brian? OK, keep looking and we can see what we can do. with the pot and the mirror under consideration. ..but there's more of a margin on the Bretby. Time for a closer look, then. it could adorn your dressing table. It would be late Victorian. back in the day, but it's not. This is electroplate, I'm quite sure. A rich thing in its day. Flamboyant, but just affordable. -so I can make them 30 quid a pop? -Looks like a deal, then. That £60 completes Paul's purchases. But what about our Newmachar correspondent? Back in those cabinets again, eh, girl? Look at that sweet little pillbox. Opening up these two little hinged lids there for little pills. However, it is not hallmarked. to be hallmarked, so it's definitely not English. a really good deal on this. ..I just found your little pillbox. I am really concerned that it might be plated and not solid silver. You've got £38 on it. you're probably as well just to pass on it. I was thinking maybe of taking a little gamble with it. I was thinking 15, to be perfectly honest with you. OK, well, let's make it 18 and we can do a deal at that. -If we weren't going for that, then maybe the telescope. Yeah, that missing lens cap. So, what would work for you on the telescope? We could make it 35, I could do it for that. Can you come down to 30 on that and then I'm done? This is it, this is the end of the road for me! So, with everything in the bag, let's take a sneaky peek. a compact and a glass. How is the mood in the two camps? Am I worried? Oh, yes, I am. The champagne glass, it needs five friends to be worth money. I particularly adore his brooch. That is exquisite and he paid £10. The book, I just don't know. that's bad news for me. making for their final auction of the week at Aberdeen. And still as fiercely competitive as ever. Well, it's last chance saloon, this. So, what might our final score be? The thoughts of auctioneer Steven Donaldson, please. The telescope, an eight-draw, it's quite a nice thing. A Scottish scope and a good size. There's been a little bit of interest in it. I think this might do quite well today. We've got a lot of other military items in the sale. I think £40-£60 for this lot and possibly a touch more. Cor, that will please Paul. It's got a great feel, this auction, hasn't it? First under the hammer is Paul's bargain brooch. -Got a little friend bidding on it. 100, sir, rounds it up. 105, 110 - he's back. 115. What a great start, eh? Hard to see Catherine overtaking him now. Do you know what? I don't even know what it made. After 100, I cried. Another Paul purchase - the pot. Any advance? 12 - we're off now. -Oh, don't be off now. Oh, well, he really mustn't grumble. These people are going already. Quite. But not when her carpet bowls are up for grabs. £50 for these nice bowls. -No-one's interested? £10. 10 bid, thank you, sir. -One bid at 10 for the Victorian carpet bowls. Going to be sold at £10 only. 25. All done and finished at 25. Someone has got some nice lumps of lignum vitae there. I would be genuinely upset if it was you. -You'd be dancing a jig. Time for Paul's stylish stick stand. 30, 32, 35 - new place. -They all want it now. They're queuing up, forming a queue. Form an organised queue. I'll sell for 50. Are we all done? Like the man said, a fair reward. How will her colourful compact fare? £10 for the Art Deco. 10 bid. Going to sell it, if we're all done and sure, at £25. No shame. No glory, but no shame. A loss after costs, but she just about got away with that one. Time for one of Paul's stranger buys - the thimbles. £30, then, for the silver thimbles. Bid. Any advance on 20? I've got one bid standing in the room at £20. The huge profit from the brooch more than makes up for it. Catherine's big draw - no lens cap, remember, though. And I'll start bidding with me at £40 on this lot. Is there any advance on 40 for the scope? It's on commission at 40. -Are we all done and all sure at £40? -That's all right, you did OK there. Yeah, buck up! A clear profit. Now it's champagne for one. £10 for the champagne glass. 5 for a nice decorative glass. I am going to sell for 18 if we're all done. What can Paul's shiny mirror manage? 40 for this Victorian mirror. £20 only for the mirror is bid. Thank you, sir. 30, then, back where we started. Are we all done and sure at 30? I will sell at 30. I'm going out with a whimper. He can afford it, mind you. Now, will Catherine finally ring up a profit with this? My stomach's going over and over. This is not good, I'm not normally like this. £30, then, for this bell. -Why isn't he ringing it? Is bid, 10 with the gentleman. It's 22 with the lady. 25. I'm going to sell it at 25. It's a faint tinkle, that's what it is. Remember the auctioneer predicted good things for Paul's militaria. -Some interest on the sheet starts me at £40 for this. Is there any advance on 65? Being sold at 65, all sure? Aberdeen wanted it, whatever it was. Almost everyone likes cats, don't they? about £450 for me to be on the same level as you. 20. I've got 20 on my right. -OK, 40, then, back where we started. Are we all done and selling at 40? -At 60 on my right again. Is there any advance on £60? I'm coming back, I'm coming back. Well, it was certainly good to end on a profit. Right, come on, that was brilliant. after paying auction costs he's made a profit of £82.10. So his final total is £484.56. -Go on, then, be nice, be nice - for once. -Oh, thank you, sir. It's been fun, hasn't it? -And at the last minute, you peaked. -Over the horizon once again. And what a week they've had, eh? Could be a brush for a very small house. -Going to point to you now. ..and Charles sniffs out bargains. Auctioneers Catherine Southon and Paul Laidlaw embark on the last leg of their road trip, shopping in Perthshire and Angus. Who will win the final decisive battle in Aberdeen?